As we prepare to mark the one-year anniversary of the deadly white nationalist rally in Charlottesville and the subsequent response of President Donald Trump, let’s take a moment to understand what this means for America today. And our president’s response to this was that there "was blame on both sides." Sometimes we like to pretend that this kind of thing is unprecedented in America. It is not. These white nationalists, as well as many commentators that support Trump, have a long history in America of using people’s fears of a changing country to create hate against anyone who doesn’t look like them. 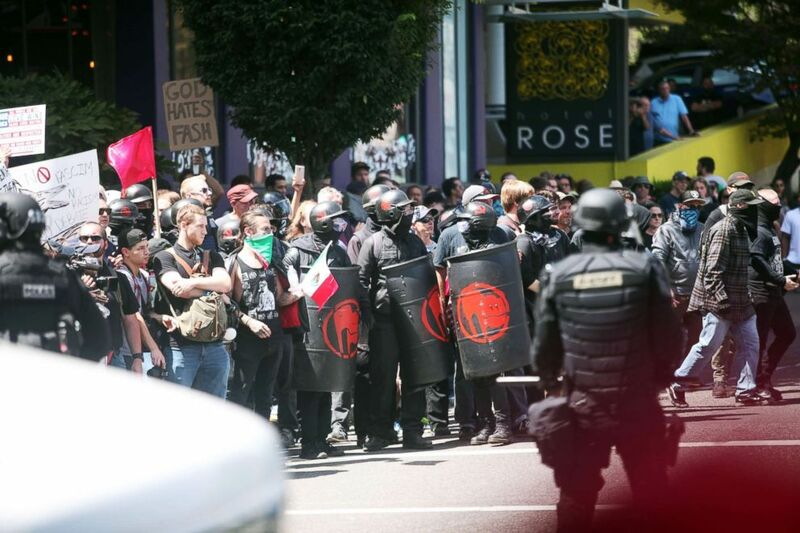 (Thomas Patterson/AFP/Getty Images, FILE) People on all sides of the political spectrum gather for a campaign rally organized by right-wing organizer and Patriot Prayer founder Joey Gibson in Portland, Oregon, August 4, 2018. Those people speak to our hopes and don’t demonize someone that might not look like us. These loving leaders see the benefits of an inclusive country and culture, and appeal to people’s better angels, trying to get us through these transitions of change. As we think back on Charlottesville, we need to understand that we are at one of those critical moments. Today we have a leader in the White House who believes in the short-term gains from fear and appealing to people who don’t like diversity in America. The president not only has equated hateful white racists with people peacefully protesting, but even in his announcement as president he pointed to the scourge of immigration, calling Mexicans "rapists," ripping into women for their looks, trying to push through a Muslim ban and doing everything possible to make anyone who isn’t a white Christian the enemy. 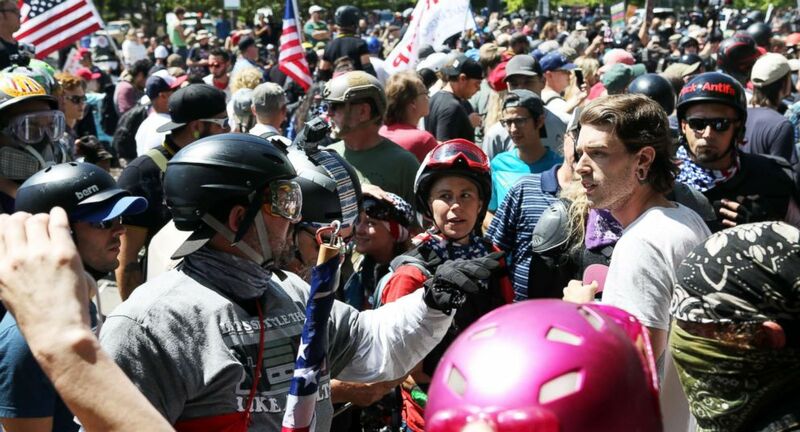 (Thomas Patterson/AFP/Getty Images) An alt-right sympathizer,confronts another protester at a rally that was held in Portland, Oregon, August 4, 2018. Laura Ingraham, a Fox News anchor, on a recent broadcast stated this viewpoint very succinctly when she said, “In some parts of the country, it does seem like the America we know and love doesn’t exist anymore. Massive demographic changes have been foisted upon the American people, and they are changes that none of us ever voted for, and most of us don’t like.” You don’t need Rosetta Stone to translate this: She is saying America is becoming less white, less Christian and, for her and many others she speaks for, that is what they think America is. And that moral majority was on Heather’s side in Virginia.